Well, although the official press-releases don’t mention it, the initial pilot project that the vendors were require to model was particularly difficult. Apparently, given this was a mock project, many of the parameters were left blank by some participants, and actually marked for completion by the “end-user” as would be the case in a real-world scenario. These were then interpreted by the buildingSMART judges as errors, and penalties applied. According to a source, all submissions made this type of error, however in the case of the Graphisoft submission, this error was replicated many times throughout the project file – thus accounting for the large penalty difference. With that in mind, it would seem that the follow-up COBie Challenge for 2014 (which begins shortly) will be a much closer affair, as all participants will now take much “extra care” to avoid such errors. Autodesk post on the COBie challenge results from Inside the System Blog (and below). Autodesk Revit wins the buildingSMART alliance’s Design COBie Challenge. The Design COBie Challenge is an opportunity for software vendors to demonstrate the conformance and accuracy with the vendor-neutral interoperability format (COBie) that supports the exchange of building asset information. The 1st test was for architectural design software at the early stages of the design process. The 2nd test was with software that supports the delivery of a consolidated design model at the Construction Documents stage of design. The 3rd test was with construction and commissioning software that imports data from Construction Documents stage COBie, updates that with construction data, and exports the Construction Handover Stage file. The Autodesk Revit 2013 COBie Toolkit (plugin application) allowed the user to streamline the export and comply with the COBie xml table format (e.g. MS Excel) with almost zero errors. The user utilizing Autodesk Revit 2013 software is estimated to have to spend 9 minutes cleaning/fixing the COBie file for a facility of comparable size and complexity. This entry was posted in BIM Collaboration, BIM Software, COBie, IFC, Uncategorized and tagged COBie, IFC4 on April 9, 2013 by rumbelom. IFC4 officially released. The Evolution of BIM. Congratulations to Dr Thomas Liebich and the team on the public release of IFC4! After over 6 years of development and over 1100 issues being resolved, on 12. March 2013 buildingSMART international has finally released the new generation of IFC schemas – IFC4. It will now be the basis of future work of establishing new open BIM enabled work flows by defining new IFC4 based model view definitions. The official IFC4 release includes both the IFC4 EXPRESS schema to support current STEP-based IFC exchanges, and the ifcXML4 XSD schema to support new simple ifcXML transactions. A recent article regarding the significant improvements to the IFC4 schema was included in the Spring edition of JBIM (Journal of Building Information Modelling) by Tim Chipman is deputy leader of buildingSMART International’s Model Support Group. Tim Chipman is deputy leader of buildingSMART International’s Model Support Group and develops software at Constructivity. In recent years, the Industry Foundation Classes (IFC) standard for building information modelling (BIM) has seen widespread adoption, supported by approximately 150 registered software applications. This article describes the next evolution across software applications. The goal of IFC has always been to describe how building information can be leveraged across applications within and across vertical industries, supporting the vast array of disciplines encountered in the building industry. To be useful across such a large ecosystem, such standards must capture necessary detail to describe how a building is to be built, along with the many non-physical aspects describing who is doing what, when, how and why. Meanwhile, many downstream applications are only concerned with subsets of this information. Another aspect to address is the format of information, which must accommodate changing technology and diverse platforms, such as phones, tablets, desktops and servers. For basic applications, XML provides ease of integration; compact formats such as STEP Physical Format (SPF) are more practical for representing buildings in detail; spread sheets such as Excel provide access to a wide range of users without custom software; and databases of various forms may support collaboration among concurrent users. Meanwhile, as more applications adopt IFC, customers have asked for deeper integration to capture more detailed information across applications in a consistent way. To support this growing usage, IFC has evolved with initiatives on multiple fronts. Data model: A number of enhancements have been introduced in IFC4, with a focus on system-wide improvements while maintaining backward compatibility. Parametric design: While buildings are ultimately made of discrete components, during the design process it is often desirable to use higher-level representations reflecting the design intent, so that changes can be made in one place, where the composition and layout of components, can be automatically updated to reflect the change. IFC4 introduces the concept of material profiles, where axis-based components, such as beams, pipes and ducts, can be described by paths and cross-sections of materials, along with offsets relative to the axis and end points. Similarly, a concept of material constituents has been introduced where components, such as doors and windows, can have various parts (for example, framing and glazing) designed by geometric aspects and corresponding materials. Material layers allow flat components, such as slabs and walls, to be described by material thicknesses and boundaries with offsets. Geometry: IFC4 expands geometry to support more complex shapes as well as simplified geometry. Complex shapes may be exactly described using Non-Uniform Rational B-Spline (NURBS) curves and surfaces. Simplified shapes may be described using tessellated surfaces with compact lists of vertices and triangles, providing the closest mapping to GPUs and more efficient processing as may be suitable for mobile applications. Libraries: IFC4 supports capturing templates of products, processes, resources and property sets. These files can be referenced by other IFC files that include instances of such templates. Ports: Ports provide the capability for MEP elements to connect through pipes, ducts or wires. IFC4 extends the capability for defining ports at product templates and standardizes ports on objects according to product type. For example, a water heater may have ports for gas or electricity as input, cold water in and hot water out. This enables products from different manufacturers to be intelligently connected according to system type and connection geometry. Processes: IFC4 expands the process model to support scheduling of tasks, procedures and events, with expanded detail as found in leading scheduling applications and 4D simulations. Process templates allow common processes to be captured in libraries and re-used. Resources: IFC4 expands the resource model to track costs and environmental impacts of materials, labour, equipment and other project resources with expanded detail. Resource templates allow common resources to be captured in libraries and re-used. Constraints: The constraint model has been formalized so that requirements may be directly validated on any object attribute, either directly or along a graph of objects and collections. For example, a requirement may indicate that the height of a space must exceed a certain length. Constraints may also be used to indicate mapping of data to external files, conflicts when multiple versions of a model are merged, formulas based on calculations from other attributes and tables of values that apply for parametric modelling. Documentation: Published as ISO 16739, the documentation for IFC had to undergo rigorous adaptation to meet requirements for formatting and content. At the same time, documentation was expanded to provide real usage examples for hundreds of product types, while eliminating redundancy by organizing common concepts in a central place. Documentation is now multi-lingual, with translations in five languages as of this writing. Definitions: IFC, along with hundreds of other engineering standards, is defined using the EXPRESS data definition language, where the rich semantics allow virtually any other schema representation to be derived. The IFC4 documentation now includes a simplified XSD-based representation for all data types, enabling XML to be used in a more compact form with better readability. Diagrams: Instance diagrams are now included for all data types. Because building Journal of Building Information Modelling components in the real-world have a vast number of relationships (for example, how connected, where placed, when constructed, who is responsible and what changed). Relationships must also be captured in data model, where diagrams make it more clear how the various objects interact. Examples: Sometimes it is easier for software developers to understand new concepts by seeing tangible examples rather than sifting through definitions. The IFC4 documentation now includes a comprehensive set of examples in various domains including: architectural; structural; mechanical, electrical and plumbing scheduling; and estimating. Model views: While the IFC specification defines how to represent BIM electronically, it does not indicate what should be included for particular scenarios. The concept of a model view definition (MVD) has evolved to fulfil this role, describing exactly what information must be included for a handover, such as for a building maintenance request. Contracts may be written to require information at a particular stage using the referenced model view, where submissions may be electronically validated and enforced. mvdXML: In parallel with IFC4, the MVD approach has been formalized so that requirements may be defined in a way that is computer-interpretable, yet human-readable in resulting documentation, using a format called “mvdXML.” MVDs may also define mapping formats for translating information into general-purpose applications such as spread sheets. The electronic encoding of MVDs now also makes it possible for a new class of software applications to adapt data to conform to the MVD without prior knowledge. Tools: buildingSMART International has provided a new tool called ifcDOC for authoring model view definitions and producing resulting schemas, documentation and diagrams. “is same tool is used for generating IFC documentation, the Construction Operations Building information exchange (COBie) specification and a growing population of MVDs. To take advantage of new BIM capabilities and much-improved software interoperability, visit www.buildingsmart-tech.org to find the growing list of applications supporting IFC4. This entry was posted in BIM Collaboration, BIM Software, IFC and tagged buildingSMART, IFC4 on March 14, 2013 by rumbelom. SIAL is pleased to host an OpenBIM event on the evening of Monday, 18th February 2013. Jonathan Mirtschin will present on OpenBIM workflows and the research/development that he has done in the past 3 years. This will include insights to project application of generative BIM workflows form Grasshopper to Revit and Tekla. Jon will be joined by Dr Thomas Liebich, team leader of of the IFC Development for Building Smart International and also a director of AEC3 based in Germany. Jon Mirtschin a structural engineer who completed a double degree in Structural Engineering and Computer Science at the University of Melbourne. He worked as a graduate at Aurecon on projects such as Eureka Tower, Melbourne Cricket Ground Redevelopment before moving to London. There he was introduced to Rhino3D which was successfully used on projects including the Infinity Bridge and Olympics Velodrome. This work formed the basis of his company Geometry Gym specializing in Computational Geometry and BIM Software tools including Rhino to Revit IFC connector, Rhino3D Structural Analysis Plugin to convert structural models to Rhino. Dr Thomas Liebich graduated from Architecture from the Bauhaus, Weimar in 1994. Since 1999 he has lead the IFC development team (Model Support Group) of buildingSMART International. In 2001 he was instrumental in the development of ePlanCheck in Singapore, the world’s first automatic test system of the building permit. In 2006, Thomas formed AEC3 GmbH, completing several major projects including the first German BIM policy, and the first BIM report for the public sector in Germany. Registrations commence at 5:30 pm with presentations from 6pm. Venue: Design Hub (Building 100, Level 1 Multipurpose Room). The Design Hub is at the corner of Swanston & Victoria Street. This entry was posted in BIM Collaboration, BIM Software, IFC and tagged IFC4 on February 14, 2013 by rumbelom. With the success of our first IFC Evening Event, Cadimage is holding a follow-up presentation featuring a “sneak peak” of IFC4 and its extended geometrical capabilities. Special guest speaker Jon Mirtschin, blogger, engineer and software developer will present his observations, research and tools which utilise the IFC standard for BIM and geometry exchange. Jon will also demonstrate some of the improvements in the new revision IFC4 (pre-ratification) and will open up discussion on is can be done to motivate software vendors to embrace and utilize this technology, opening up more collaborative and powerful workflows. The presentation will also demonstrate some exchange improvements Jon has developed with BIM software including Revit, Archicad, Tekla and Solibri and some of the projects that have benefited from it. 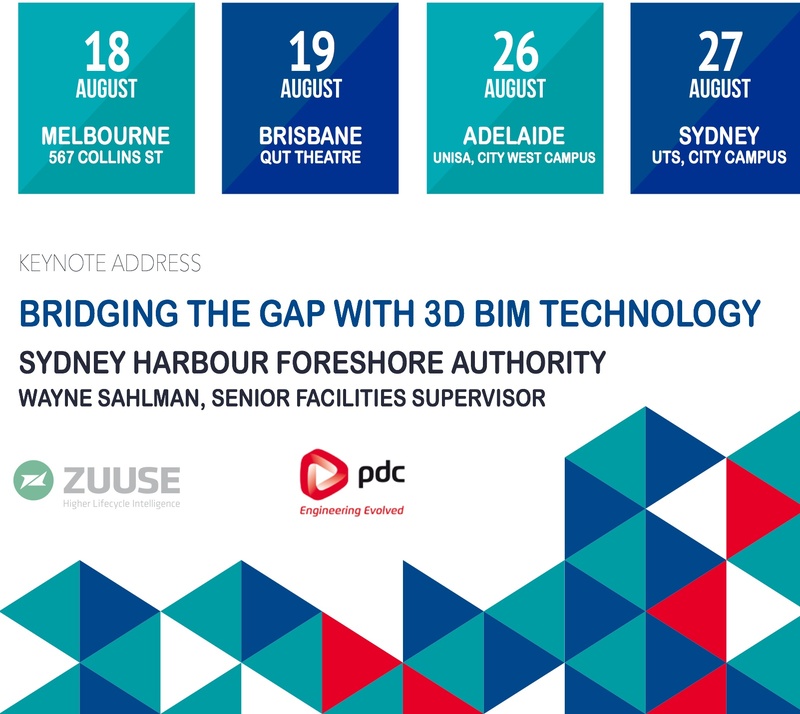 CPD Points: Registered attendees will receive 2 CPD points as accredited by the Australian Institute of Architects Continuing Professional Development Program. This entry was posted in BIM Collaboration, BIM Software, IFC and tagged buildingSMART, IFC4 on February 14, 2013 by rumbelom.